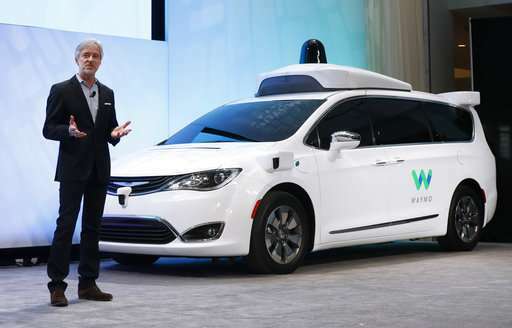 Delivery of the Chrysler Pacifica minivans is expected to begin later this year, with the automaker also trying to build Waymo technology into a self-driving car it might add to its model line-up for consumers. "FCA is committed to bringing self-driving technology to our customers in a manner that is safe, efficient and realistic," chief executive officer Sergio Marchionne said in a statement. "Strategic partnerships, such as the one we have with Waymo, will help to drive innovative technology to the forefront." The announcement was made a day after Uber chief executive Dara Khosrowshahi reportedly said at a Code technology conference that the company is speaking with Waymo about putting its cars to work at the smartphone-summoned ride service. Uber early this year negotiated a settlement with Waymo over trade secrets purportedly purloined from the self-driving unit of Google-parent Alphabet. Uber suspended its own autonomous car testing in April after an accident that killed a woman pushing a bicycle in a street in Arizona. Waymo CEO John Krafcik has publicly contended that the fatal accident involving a self-driving Uber car would not have occurred with his company's technology. 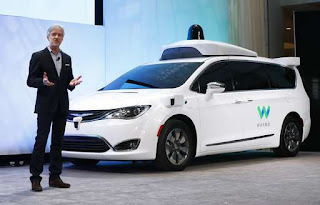 "Waymo's goal from day one has been to build the world's most experienced driver and give people access to self-driving technology that will make our roads safer," Waymo chief executive John Krafcik said in a joint release with Fiat. Fiat and Waymo first announced a self-driving car partnership two years ago, and said that engineers from their companies have been working together since then. Fiat has delivered 600 Pacifica Hybrid minivans to Waymo so far, the companies said. Earlier this year the companies said "thousands" more would be added. Waymo and Jaguar Land Rover in March announced they have joined forces on a posh, self-driving electric car tailored for a ride-hailing service run by the Google-owned firm. Waymo and Jaguar said they aim to develop a "premium self-driving electric vehicle" based on a new I-PACE model. Waymo appeared to be hitting the accelerator in a race for leadership in autonomous ridesharing, which involves most major automakers, technology developers and services such as Uber and Lyft. Separately, Japanese telecom giant SoftBank said Thursday it will invest $2.25 billion in General Motors' autonomous car program in exchange for a stake in the venture. The investment from the SoftBank Vision Fund in the GM Cruise Holdings will be executed in two stages, with the first $900 million coming after the transaction is finalized and another $1.35 billion once GM vehicles are ready for commercialization. GM has said it plans to commercialize its Cruise program in 2019 through ridesharing.